In 1983, after animal activists groups like Green Peace were able to convince the European Union to ban products made from whitecoat harp seal pups, everything changed for the worst for Inuit people in the Canadian arctic. If that wasn’t enough, yet another ban in 2009 by the European Union caused even more hardship for the Inuit people who rely on their seal hunt to sustain their livelihood, their culture and economy. 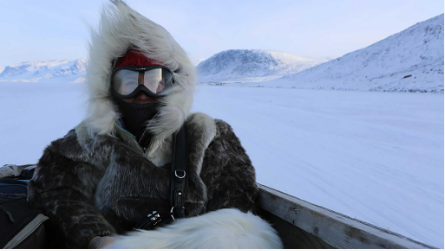 “Angry Inuk,” a film by Alethea Arnaquq-Baril, enlightens viewers by providing background on the reality behind the anti-seal hunt demonstrations and those using whitecoat harp seal pups as their slogan. By portraying the helpless baby white seal as their poster darling, animal activists have been able to, time and again, convince world governments and the public that hunting seals is “evil and cruel” and unnecessary. Arnaquq-Baril is narrator for the compelling documentary, which was filmed over a seven-year period beginning in the spring of 2008. The film shows the pristine landscape of the Nunavut Territory in the Canadian Arctic and looks into the Inuit people and their way of life. It explains how the seal hunt is so much a fundamental part of Inuit culture. After the 1983 seal hunt ban was imposed, most Inuit people had no choice but to move away from their traditional grounds and into town because the price of seal skin completely crashed. Most Inuit had to find odd jobs creating carvings and perform whatever other jobs they could find. But the Inuit still had to hunt seal for food. Arnaquq-Baril said the 1983 ban was their “Great Depression” as it was a life altering event for the Inuit. Within a year of the ban the suicide rate spiked even higher and has risen to rank among the highest globally ever since. In 2009, the filmmaker followed a group of Inuit representative who traveled to the European Union Parliament to voice their opinion on banning the seal hunt. The viewer will see their efforts were futile and did not change world leaders’ minds on the vote. “Angry Inuk” is a film worth watching and may even change your thoughts on the Seal Hunt Ban lobbied for by Green Peace – an organization responsible for successfully implanting the erroneous image of the “evil and killing of the baby white seal” in the minds of those not educated to the facts of Inuit life.